Use on right angle grinders with a backup pad. Available in 4½" and 7" diameters. Excellent for surface grinding, sanding, and weld blending. Use the aluminum oxide for ferrous metal grinding. 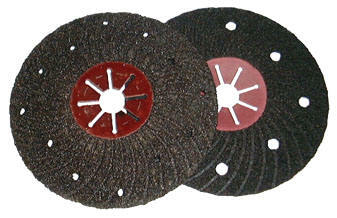 Use the silicon carbidediscs for grinding concrete, granite, marble, and other stone like materials.